Recently my two sons and I attended a Michigan Basketball game in my hometown of Ann Arbor. Like most early season games, this one was a total mismatch. With a few minutes to go as I expected my Wolverines were up by almost 40 points and I asked my sons if they were ready to go. Thankfully my boys will only leave a Michigan game when there are zero’s left on the game clock so I was forced to stay until the end. What unfolded in those final seconds was one of the most moving moments I’ve ever witnessed at a sporting event and a true lesson in leadership and life. As the seconds winded down I heard people in the small crowd start shouting for the coach to put in a player named Austin Hatch. I sat there puzzled wondering who was this Austin Hatch. Since both my boys are digitally plugged into everything there is to know about Michigan sports, they began to tell me what they knew about his story. Interested by this I sat up in my seat to take a look. Sure enough a player that hadn’t been in the game the entire night stood up, and the sparse crowd erupted as this gangly kid was announced and walked onto the floor. Now that I knew a little bit about his path to getting here, I started getting excited for this kid as well. With about 40 seconds to go Austin Hatch got the ball and everyone in the arena cheered, begging him to shoot, but he passed it off. The next time down the floor he got that ball again, the crowd cheered louder, yet once again this young man looked to pass instead of take a bad shot. It was then that destiny stepped in… Austin Hatch was fouled. With two free throws coming the crowd waited on pins and needles hoping beyond hope that this kid would somehow make at least one shot. The first ball goes up and missed badly, and the crowd sighed in agony. The second shot went up…swish right in the back of the net. The small crowd was as loud as I’ve seen in that arena, everyone smiling and hugging like we’d just won a championship. Chills went up and down my spine. It was then that this amazing moment got even better. Coach John Beilein (pronounced Bee-line) quickly called a time-out so this young man who has been through so much adversity, that less than 4 years ago couldn’t even walk, talk or feed himself, or even think about playing basketball could savor this moment. Austin Hatch and his Coach embraced in a long heartfelt hug, not the kind of hug from winning a game, but a hug that symbolized so much more. Like many in the arena that night, overwhelmed by emotion, I began to cry. On the drive home I had my sons Google this young man so they could read me his entire story, and I learned that this wasn’t just about a courageous young man fighting back against all the odds. This story was also about a head coach who understands that life is about a whole lot more than that what takes place on a basketball court or any sports field. And Leadership is about doing what’s right and keeping your word even when it may seem inconvenient. At the age of 16, Austin Hatch was a star basketball player and prized recruit who had survived a plane crash that took the lives of his mother and 2 siblings. He made a verbal commitment to Coach John Beilein to play for the University of Michigan, and several days later would fall victim to a second plane crash that took the lives of his father and step-mother and left him with a traumatic brain injury and in a coma for two months. The journey back to the basketball court for this young man is something I doubt I could even fathom. Yet I learned that his journey was supported the entire time by Coach Beilein, who not only stayed part of this young man’s life, but chose to honor the scholarship he had awarded this kid prior to the plane crash. That’s what I call keeping your word. There is no strategic basketball reason to give this kid a scholarship, other then it’s just the right thing to do. That’s how you set the example for the young men and women that collegiate sports contend to care so much about. That’s truly walking the talk. 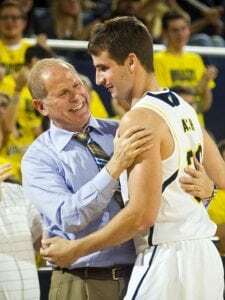 That embrace between Austin Hatch and Coach Beilein was about a lot more than basketball. It was the end of a long hard journey and the beginning an entirely new one. In a time when all we hear about in sports is what is going incredibly wrong, this night, for one moment encapsulated everything that sports can and should be. I feel privileged to have experienced this moment in the company of my two sons. This night Austin Hatch and Coach Beilein were the undisputed Champions in the game of life. How are you keeping your word to those you lead or care about? What lessons are to teaching your teams about doing the right thing, even when it’s a little inconvenient? How are you going to win a championship in your own personal game of life? People with integrity are in short supply. Wonderful to celebrate the efforts of an individual doing the right thing, and the support of others to embrace this accomplishment. Ethics, and values make the difference, on people that you want to be associated with, in business and personal lives. I’m glad you’re the kind of father who knows when to listen and give in to his children. You’ll all remember this night and it’s lessons forever. Coach Beileil left WVU (my alama mater) with a multi million dollar buyout. The class guy that he is, he did not duck or tried to weasel out of paying his contracted obligations. Between himself and UM, that buyout was paid to my knowledge. I have always respected him for honoring his debts unlike some of our other coaches. Congrats on a great coach. Another great Quarter Turns, Tim! wow, I’ve got goose just reading this.. What a great moment to share with your 2 sons. The Michigan is truly a great coach and a true man of honor. wow, I’ve got goose bumps just reading this.. What a great moment to share with your 2 sons. Coach Beilein is truly a great coach and a true man of honor. Very touching! And a great reflective moment.